You will save time and money on airport parking at Ted Stevens Anchorage International Airport (airport code ANC). Anchorage airport has a couple of airport parking options to choose from – the airport parking lot and Diamond Airport Parking. The airpor is located on International Airport Road, approximately 6.5 miles from downtown Anchorage. As Alaska Airlines‘ second-largest hub, Anchorage offers an average of 20 flights to Seattle each day, and more than a dozen to Fairbanks. In addition to baggage storage, the Anchorage airport also provides freezer storage – open from 5 a.m. to 2 a.m. each day. 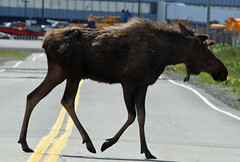 For traffic information, visit the Alaska Department of Transportation website here. Taxi: Three taxi services frequent the airport from Anchorage – Alaska Cab, Checker Cab and Yellow Cab. Bus/Shuttle: Anchorage’s People Mover Bus heads to the airport every half hour, except from 11 p.m. to 6 a.m. Shuttles include the Tortoise and Hare, Eagle River Shuttle, Shuttle Man and Talkeetna Shuttle. Planning a long drive to or from the airport, or an odd-hours flight? Check out Anchorage Airport (ANC) park and sleep hotels. Don’t fancy driving to the airport? Or leaving your car there and paying for parking? Catch a shuttle to Anchorage airport.